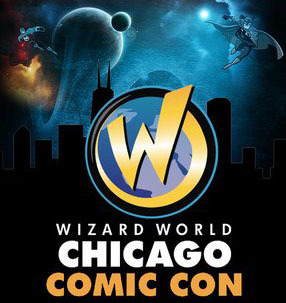 Wizard World Chicago Comic Con returns to the Donald E. Stephens Convention Center in Rosemont tomorrow and will run through Sunday, August 12th. I’m not big on comic books, but there’s something about events like this and C2E2, which was held in Chicago this past April, that I find dazzling. There are tons of vendors selling comic books, t shirts, action figures, and other fantasy/sci-fi related artifacts. Some people dress up in super hero costumes; where else are you going to see Captain Jack Sparrow and Harry Potter walking side by side? The biggest draw for most people though is a chance to meet celebrities. This year’s guests include William Shatner; comic book icon Stan Lee; Tom Felton, who portrayed Draco Malfoy in the Harry Potter films; Scott Bakula from Star Trek Enterprise and Quantum Leap; Laura Vandervoort from Smallville and Ted; Lauren Holly from NCIS and All My Children; Amber Benson and Juliet Landau from Buffy The Vampire Slayer; Holly-Marie Combs from Charmed; Avery Brooks from Star Trek: Deep Space Nine; Dean Cain from Superman; and Sean Young from Bladerunner. There are lesser-known but still interesting media personalities to be found seated at rows of tables in the convention hall. Large media corporations, as well as individual artists, come to Comic Con to hawk their wares. Back in 2010, I encountered an attractive model in a revealing school girl uniform who was hyping a graphic novel/potential movie called Bad Kids Go To Hell. There's a sprawling marketplace called Artists Alley where artists compete for attention from the people passing by. This is where I first met Steve Guzelis, who in addition to being a comic book entrepreneur, sells rock and roll posters. He created a very cool, custom-made poster of The Hollies for me, showing the band at its various stages over the years. I used one of his works, Psychedelic Bands Of The 1960s, in the Manchester Gallery series my wife Pam and I created for the Sunday Morning Coffee With Jeff internet show. This year’s Wizard World Comic Con is sure to offer another eye-popping round of celebrities, merchandise, and fans in costumes.